I just wanted to let you guys know that my husband, Matt, and I love listening to your podcast and really enjoy hearing all the stories about mushing! Last year we took in two husky mix puppies from an Ojibway reserve where we were teaching in Northern Manitoba. Now the puppies, Mika and Nanook, are almost a year and a half old and are learning how to pull me around the tundra in an old dog sled an Inuit man recently gave me. 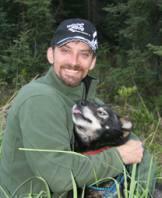 When I listen to the mushers like Lance Mackey talk about their love of dogs and sport I can definitely identify. Our lives have totally changed after caring for these two strays, and I can’t imagine it any other way! Keep up the great interviews! That was such a fantastic interview. I was really touched by Lance’s Iditarod win and I listen to him speak every chance that I get. You guys did a great job! Go Lance!! !